Our PREMIER 300 Chipper Shredder has the muscle to chew through hardwood branches up to 3" in diameter and shred half-inch thick yard waste. We made it easy to maneuver, easy to use, and a terrific value! Easy grip handles on the shredder chute and light weight (126 lbs.) make for easy maneuvering. But don’t let its size fool you—this is one tough machine that will devour 3” branches and shred yard and garden waste up to ½” in diameter. Shredder reduces yard and garden waste 10:1! The big shredder hopper accepts all your yard and garden waste—weeds, leaves, prunings, sticks, pine cones, and more—and reduces it all to a fraction of its original volume. The byproduct can be added to your compost or tilled into your garden in the fall. Easy grip handles on the shredder chute and lightweight construction (126 lbs.) make for easy maneuvering—around your yard or in and out of storage. And its compact footprint lets you stow it anywhere, even where floor space is limited. Don’t let its size fool you. This machine has serious power and will make short work of branches up to 3” in diameter, and armloads of yard and garden waste up to a half inch in diameter. It’s nimbleness makes it a great choice for working in heavily landscaped areas. Shredding is accomplished by 8 free swinging “hammers” that mash and pulverize materials into a fine organic mulch that’s great for recycling into your landscape—either by tilling into your garden or feeding to your compost pile. Included with your chipper, this durable bag with drawstring fits around the discharge chute and is great for use around flowerbeds, carefully maintained lawns, or any other place where you want to control the discharge and keep things tidy. The legendary power, performance and durability of Briggs & Stratton® engines make them the only ones we use on our DR Chippers. The PREMIER 300 Chipper Shredder uses a durable 208cc Overhead Valve, easy-starting engine. It features a debris management system that protects the engine from whatever you kick up while you’re chipping and shredding. Designed for maneuvering around your yard easily, the “kickstand” makes it easy to transition between travel mode and work mode. Just lie it back on its wheels (like a mover’s dolly) to travel, then rest it on the kickstand when you’re done. Hopper Opening Size 7.25" x 7.5"
Shipping Dimensions Box 1: 24" x 22" x 26" Box 2: 18" x 23 x 28"
Shredder Hopper Opening 18.5" x 12.75"
This chipper ate up everything I threw at it. I was always wary about burning brush near my backyard tree line and the pile just kept getting bigger while I waited for the right opportunity to burn. Well, that didn't happen so I bought the electric-start DR Power chipper/shredder. It does the job it was purchased for but the cardboard shipping box for the main unit was way too flimsy and the box was essentially destroyed when it was delivered. Thankfully it was stout enough that there was no damage. Assembly went well but there were a few missing self-locking nuts. I also bought the extra knife and the optional tow bar to pull it around with my lawn tractor - it's well worth the expense in my opinion. Like I said before, the unit worked well enough to give me a nice big pile of mulch for plants around the yard. I also intend to use it on several piles of oak leaves for additional mulch. Been using this chipper for 2 weeks and couldn’t be happier. Best little chipper I ever had and I had a couple. Built real well. Looking forward to years of service. Overall I'm very pleased and happy! Great piece of equipment except for the throttle. It takes an extreme amount of force on the throttle in the stop position and it runs forever before it shuts off. Sometimes as much as 3-4 minutes before shutting down. The assembly instructions were incomplete. The machine clogs very easily we feeding any thing damp through it.pine cones will easily stop it from feeding material through. The reduction ratio is great. I am very pleased with this limb chopper/ shredder..I have purchased 2 stump grinders from DR Equipment:one about 11 years agoit is still going strong in Indianaand one last summer to use here in Missouripersonal use and I highly recommend DR equipment!! I needed a Chipper Shredder that would fit through a 36 inch wide door. This thing fits with room to spare. It also doesn't take up much space when in storage. The chipper section just chews up everything you put in the chute. The shredder chute can bog down if you feed it too much too quickly. This machine is well built and hopefully will last for years. Starts easy and runs great. Perfect for small homeowner needing occasional chipping. I have used my 9.5 chipper for between 4 and 5 hours. It worked as advertised. I hope it continues the good operation. I highly recommend getting the tow hitch accessory. It definitely makes it easier to move around. I also recommend paying the extra money for the electric start, especially for older people. You must be patient with leaves and the shredder works better is the leaves are dry. Pine straw also works well through the shredder. The chipper is efficient and works well. The operating instructions are well written and informative. As with any piece of equipment, a little common sense goes a long way. The chipper works good until you fill the bag, which happens quickly, and then it cuts off. If you still have debris in the blades you have to take off the rubber shoot to clean it out before you can start it again. The shredder takes to long to chop up leaves as it gets clogged. We moved to a property where I could carve out walking paths. I had a chipper from a common hardware but took FOREVER to chip a small pile of branches. Got our new DR and zip! That branch is chipped! 10 minutes for a decent pile of debris. I love it! Once I figured out that I needed to feed small branches, fir cones and leaves slowly into the shredder hopper the unit worked great. The output was much finer than I anticipated which is super!. Only complaint is the location of the oil fill tube - it is very hard to get to. Plus the cap on the oil fill tube can't be twisted open easily because it hits the shredder chute I used wire cutters to trim down the plastic cap so it now easily twists off. However, it is a great unit and I'm very pleased with its operation. As I said, it seems to be running well and I did a test run with various sized tree limbs and it went through them like butter. Fired right up on first try. I removed two stars due to missing parts, damaged shredder chute. Also it is almost impossible to attach the rubber chip deflector with the 3/4” bolts and washers. Had to leave the washers off due to thickness of rubber. They should be 1” instead of 3/4” to allow for rubber and the thick .12” washers. Hope it stays reliable. Looking forward to using around our property. We’ve been clearing out some dead ash trees and love the job this chipper does for us! So far we have been very pleased with the performance. Looking forward to chipping lots more branches. Gobbles up all the yaupon brush, 5 hours on motor, changing oil is a bear, have to remove chipper chute to change oil, oil dipstick should be on the other side of the motor where it would be accessible, well made piece of eguipment, proud to buy American product. Easy to put together. Starts with one pull. Would buy again. 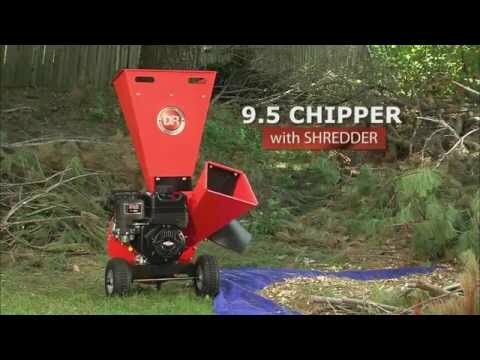 The 9.5 chipper shredder is a beast. It has handled all the yard waste I have put into it. You just have to keep an eye on how much you put into the shredder or it will bog down. Purchased shredder, easy to assemble, electric start was smart choice, immediately began to use and completely satisfied. I have approximately 20 hours on my little 9.5 chipper and I must say I am impressed. I did have a minor issue after the first couple hours when the main bolt on the flywheel loosened a bit and the flywheel started clattering. I called tech support and they sent a new bolt, lock washer and locktite to put on the bolt. Evidently, it had not been tightened to spec at the factory. I replaced the bolt and washer and used the locktite. I have had no issue since then. This chipper will indeed chip 3 logs. However, you must be smart about it. You feed it a few inches at a time. Push the log in, chip a second or so and then pull it back so you don't stall the flywheel. Though the process requires you manage it a bit, it goes quickly. Anything below 1.5 and you can just shove it straight through. In 20 hours I have made a mole hill out of a mountain of branches. It's a great chipper at a great price and it is really built tough! Highly recommened. It did what I expected it to dd: chipping branches up to 3 inches and shredding leafs and small branches less than 1 inch. This chipper/Shreder took some time for me put together. I would recommend a socket wrench which makes the job much quicker. Once together, I love the chipper as it made quick work of huge piles of trimmed trees. And the mulch was lovely put under the pine trees. The bag worked well,to keep my chipping area clean. A huge pile of trimmings became only 2 wheelbarrow full of mulch, efficient. The Shreder on the other hand is difficult to use at best. The hopper is huge, however I had to feed only a couple of small items in that Hopper at a time, and then had to slowly push them in, getting dangerously close to the hammers. And every stick I used, to push the brush in, got shredded too well. It barely touched the garden left overs shasta daisy, asparagus, etc. and wouldn't shread leaves at all unless I fed in small handfuls and then pushed them down with a stick. BUT since I really needed the chipper and have wanted one for over 30 years, it is a dream! Only wish the shredder worked as well as the chipper. I was surprised at how powerful this shredder/chipper is. It was fairly easy to assemble, instructions are clear. Took me about an hour or so. The machine started up immediately. It chipped branches very easily. The shredder got stuck a couple of times with leaves but after plunging it a few times it turned the leaves into dustno kidding. The only beef I have is that the oil spout is in a very inconvenient location on the machine. I used an extra long funnel to pour the oil and experienced a little runoff. Otherwise, the machine gets a 5 Star rating. Chipped 3 inch hybrid poplar branches without hesitation. Leaves and small branches shredded with ease. There’s approximately 10 hour run time and so far this machine has met all my expectations. We purchased this chipper to process limbs from a tree we cut in the spring. We wanted to use the chips in our chicken pens and on garden areas. It surpassed our expectations. A real necessity on a homestead. Arrived upside down. Still started on the first pull. Easy to assemble. We ran it for 4 hours, it ate through everything. I will not be feeding anything much larger than 2 inches because more than that would seem to be a tough chew for this machine, especially hardwood. It is well designed. I changed the oil with no drips or spills. The bag works really well. It is very well made and controls the mess. Weighs about 30 to 40 pounds when full. The chipper wheels around easily. It is just light enough to lug up our back yard several hundred feet up a slight grade. Starting is interesting. The entire mechanism spins when the cord is pulled. It is a slow spinup but it seems to work. The electric start option might be a good idea if you can't give it a firm tug. I am looking forward to many years with this machine. No more burn pile. I've had my new chipper for three weeks and have used it once. So far, I'm pleased with my purchase. It's loud, but it tears through the branches and brush with ease. Side note: I haven't put in anything bigger than 1.5 diameter, and everything has been green. Assembly was easy and even enjoyable. And then it literally started on the first pull! My biggest complaint and something I need to solve: when I go to power down the engine by sliding the throttle to the kill position, the engine won't stop turning. Must have been set to idle too high. To kill it, I need to either switch off the gas supply and wait 2 minutes for it to run the gas lines dry, or pull the spark plug wire--neither of which are great options, especially in the event of an emergency. Overall, happy though. This machine is perfect for anyone that has an acre or less to maintain. Assembly is a snap and the components are made like a tank. Pruning roses and shrubs and cleaning up once took me two days. All of the chipped and shredded debris was spread out in my composting bin in four hours. The engine is easy to start, runs smoothly and has ample power. Great machine at a terrific price. It's done everything I've asked it to do. This wood chipper/muchler is the perfect machine for us. Great design and runs flawlessly. With this machine our fall work has been reduced by 50 percent. Great investment! The Chipper portion of this machine is outstanding... Would give it 10 stars however, the leaf shredder leaves something to be desired. It clogs up no matter how slowly the leaves are dumped in. It clogs at the entrance to the shredder knife - a relatively tiny entry port. It could be larger. Oh yeah, a clean-out port would have been a good idea. I used it for the first time today and it chewed up everything I could put in it. I had to take down a wall of Buckthorn 15 feet high and 40 feet wide and this chipper reduced it all to a little pile of chips. It would have cost me twice this price to have a pro do the job. This really is a great tool and I'm somewhat of a snob about tools. Must have for tree filled yard. Wish I had purchased this long ago. Makes getting rid of down tree limbs a breeze. No more pilling up in front of yard and waiting for the city to pick up. This is a little sweetheart! I've only used for about 3 hours, but I couldn't be more pleased with the purchase! The two boxes arrived in perfect condition with all parts. Assembly was straight-forward. It's a portable unit it's easy to move around and has a pretty small footprint when stored. It does a great job chipping. I was really surprised with how well it self feeds, even though it wasn't really advertised as such. That was one of my main concerns with buying a smaller unit. I haven't used the shredder much, but it does take some effort to feed material past the thick rubber guard. I like that the rubber guard keeps debris from flying out of the machine, but it is somewhat tough to get the material past the guard. I'll be using more as fall approaches. Some prior reviews mentioned that access to the oil dipstick is blocked by the shredder chute. My unit has two dipsticks, one is blocked by the chute but the other is very accessible from the other side. Overall, 5 stars! Trimming trees and getting rid of the branches was always a pain because I had to drive to the dump to get rid of the waste. This chipper has saved the day. The product arrived in 2 boxes and the unit was assembled in 30 minutes. I was able to chip the huge pile of trimmings in about 3 hours with no issues. The chipper is easy to start and ran without issue. The unit does not take up much space. I have used it to shred leaves and garden waste into fine mulch. No more making multiple trips to the dump to get rid of trimmings. Great product. Easy assembly, well designed and very easy to start! I was concerned about this as my old chipper with B&S engine was always hard starting. Starts on first pull every time so far! Chipper works great! Plenty of torque. Shredder feature I was not as impressed with. Works fine for leaves, but twiggy stuff takes some time to run through. Mainly using it to chip up tree limbs so I am quite happy! I have had my DR chipper/shredder for a week now and it helped with cleanup after hurricane Florence. It was shipped in two different boxes, had to wait week for the second box with engine and chipper to arrive When it did the box was completely mangled and most of the nuts and bolts from the tool bag were missing. DR shipped a replacement bag right away.Took about two hours to assemble. The oil fill and dip stick are in a very ackward position right under the chipper shoot.Engine started on second pull and run smooth as silk. Chipper was great, the shredder needs to be fed slowly and only a hand full at a time. I was feeding green pine branches into it and it clogged up once. Recommend allowing green waste to dry out a bit to help avoid clogs. Machine is well made with heavy duty steel. Happy with my purchase. We bought this Chipper Shredder expressly for processing garden & yard waste for compost. It energetically does the job. It will not handle tree branches but it does handle plant stalks and twigs. I have used it about four or five hours and these are my impressions. The build quality looks good and I love that it's still got USA content. 1. The chipper is very effective at chipping any length of smaller branch below 1 2. For bigger branches above 1 1/2 they need to be cut less than 2 ft or the motor will bog down, especially with green hardwood. 3. I like the angled infeed. It helps out with irregular small branches. 4. The bag works great. Made a lot of mulch for my chickens. 5. The shredder is only good for leaves. Everything else should go in the chipper. It's very slow with branches. 6. Not too bad to maneuver around but you'll need some heavy gloves to hold those sharp handles. So it works well but I wish I had paid more for the more powerful unit that would handle bigger branches. I've been using this chipper for three days now and it is still going strong! It has gotten clogged a few times, but it was easy to fix. I also like the mobility of this product, being easy to move around. We're very happy with it, so far! DR Chipper Shredder 9.5 electri start issues. Assembly instructions were very good. However the product pack was short 3 of the 5/16-18 nylon lock nuts needed. It was easy to find more at the local hardware store. Also,there were a lot of extra 1/4-20 nylon lock nuts. I was almost done with the assembly when I discovered that the keys were missing! I called your support/parts department and they airmailed keys to me right away at no charge. I got the keys within a couple of days and was real happy with that quick response. The Chipper Shredder works good for the type of chipping and shredding that I do. We just started using our new chipper shredder and have run it about 3 hours. So far it is working well. We probably should have gone with a bigger unit though because our debris pile has gotten way too big. We have a lot of work to do. If the unit stands up to the pile we have it will be amazing. Just what I needed, works well as long as you don't over fill chute with over size branches, back foot stand needs to be better supported for better stability. verrry pleased with the performance. Doing just the job I needed. Arrived perfectly and with easy to follow instructions. I had an earthquake chipper shredder and spent about the same amount seven years ago and it was nowhere near as solid and well built as my DR 9.5. This thing took less time to chip and shred a large shrub as took to cut it down. I fed it and it never dropped an RPM. Tip to prevent clogging machine. Throat of shredder is small and is easily clogged and this is with palm fronds. Removed hammermill housing and flywheel housing and clean out debre. Feed very slow to prevent clogging. When a large ammout is to be shredded the chipper will do the job in much less time but the discharge debre will not be as fine as the shredder. Chipper works well, mine would not start after the first week of use, in the shop for repairs. Customer service was great. SHREDDER SIDE WORKS FINE, CHIPPER SIDE I CAN GO UP TO ABOUT 2 - 2&1/2 IN IF I FEED IT SLOWLY. OTHERWISE IT SEEMS TO BE WORKING FINE. STILL LEARNING ABOUT IT YET. DR, Done Right! Now I get it. Eazy start. Shredder seems like a little hoggess but chipper eats everything that goes down the chute. So far I have only used it with old dead branches and was able to kill the motor twice, but I am sure with 'green' wood it will be just fine. Shredded leaves and weeds like a Champ. This chipper / shredder has devoured everything I’ve thrown at it. I pruned several apple trees and walnut trees and rather than having a massive pile of branches to take to the dump, I now have a small pile of compost in the making. There were a couple walnut branches that were 3” in diameter and the chipper had no problems at all. I’m still trying to figure out what material works best for the shredder as everything I pruned went through the chipper chute. This unit is a work horse, easily chipping up 3 branches. I did have some shredder problems with some green vine-type stems from Asian Honeysuckle bushes - even 1/2 stems. I have and recommend the tow bar option if you have anything less than a postage stamp size lot. One caution, this unit is top heavy the shredder hopper is too tall and the wheel base is too narrow. These two short comings tend to create a tip-over problem if you're not on level and thus my 4-star rating rather than 5. This is a very good quality built machine. Assembly went well putting the chutes and guarding on. It started right up. The chipper worked to perfection, just dropped my sticks into the chute and they were gone. I had some problems with the shredder, though. It was difficult pushing my material past the rather stiff rubber flaps in the top of the chute.I'd rather have no guarding and wear a full face shield to protect myself. It made me wish I had a special push stick. A fine machine, though. I should get many years of use from it. Great product. Well built, no cutting corners on quality. I have used for about two weeks and have shreddedchipped about 20 bags so far. No issues, I strongly recommend. Overall, I am very pleased with this machine. It is replacing a 25 yr. old chipper/shredder that finally died. It is pretty easy to move around, although you might want to wear gloves because the hand cutouts on the sheet metal can dig into your hand if you are moving it any significant distance. The only constructive criticism I have for this unit is starting it. First, there are 3 levers - throttle, choke, and fuel shut off. The markings for the last two are hard to see. Making it more challenging, two go to the left to start it and one to the right. Either make the settings easier to read, or have them all go in the same direction. Starting it cold, sometimes I need full choke, sometimes not. So sometimes it starts on the first pull, sometimes it takes me 5-6 to figure out how much choke it wants on that particular day. Not sure what is up with that. But once it is running it is a beast. It shreds a large pile of debris to almost nothing. I thought the bag would be useless based upon my old model which did not really break stuff down into very small pieces, but this thing really breaks it down into tiny pieces of mulch. So that bag is handy. Couple of things. There is a guard at the top of the shredder. I was hesitant to put it on because it makes it a bit tricky to put debris into the shredder. It is there for a couple of reasons. One, it is easy to overload the shredder so you need to feed it slowly. It is easy to overload because debris does not just go in and out quickly. This is more like a violent garbage disposal. Debris goes round and round in there getting pulverized before getting spit out. So it takes a little bit of time to break stuff down. While that is happening, there is some kickback. Without that guard at the top I think there would be increased risk of getting hit by stuff getting kicked out of the shredder. Know that if you are putting small branches in the shredder once the blades grab them it really pulls them out of your hand and into the shredder. Also, I have found that it is better to let green material dry for a few days. I've run some green material through it but it tends to clog up the shredder. You can poke it out by running a branch through it but if you let things dry out it seems to work much more efficiently. Assembly was easy it was shipped to my door without incident. I'd give it a 5 if not for the poor markings on the choke and fuel shut off. They are clear 'out of the box.' But reality is that once you start using this dust and debris is everywhere and the next time you go to use it those markings are hard to read. This is a well made unit. Parts are solid. Works well - but keep in mind that you really need to keep below the maximum diameters to be effective - and for smaller units such as this - that means pretty clean feed stock. So far this Chipper has worked very well but the start off was rather rocky. It was delivered on time but without an assembly kit and manual. it took two separate calls with long waits times and then a weeks wait to get them and still the assemble kit was incomplete so I had to provide some of the fasteners. After about 2 uses the throttle decal fell off and had to be re-glued on. Then the throttle lever mechanism itself needed to be adjusted as the set screw was not securely tightened at the factory and it would turn itself off. These lapses in quality control gives me some pause for the future of dealing with this manufacturer. We'll see. I found the DR Chipper-Shredder as a replacement for a Troy-Built version we had for years that finally died. I was never happy with the way T-B handled larger branches and looked for an alternative. The DR version had good reviews and decided to give it a try, Could not be happier. It is quieter than the old model, despite having a slightly higher H.P. It handles 2 inch thick branches well, though I have not tied the 3 inch size yet for which it is rated. The equipment arrived quickly and in perfect condition. The assembly instructions could be a little clearer. But I eventually got it together. I have used it several times and could not be happier. Good product quality control in shipping Department. Really does a great job. You just have feed wood branches a little slower when you get up to the max dia the unit can handle. I bought this chipper primarily to mulch large pine needles. The chipper grinds them finer than the sawdust from my skill saw. Several washers missing, hopper bent and had to redrill some holes to make things fit. Chipper seems to start right up and work fine. I received the 9.5 Chipper Shredder with shipping damage. It appeared a forklift ran through the box and broke the unit loose from the shipping base plate. It had minor damage to the muffler but the throttle lever was crushed to where it could not be moved. After at least 3 phone calls and three weeks of waiting I finally disassembled the engine and reshaped the throttle lever to at least make it usable. The performance of the unit meets my expectations so far. But the lack of customer support makes me very disappointed. Got this chipper next day after ordering , missing 2 nuts ,excellent customer service. The chipper came nicely packed easy assembly , works great for my needs , shoot does clog easily when bag gets 3/4 full , but other wise very pleased. Easy assembly out of the boxes. Started up without issue. Only thing is, it doesn't like damp/wet stuff. Already had to disassemble down to removing the chipper housing to clean out the build up. And, it must be fed slowly or the shredder chute will clog. All part of the learning curve, I suppose. Makes some mighty fine compost material. This is my first DR Power purchase but I don't think it will be the last. I bought the manual start model and had some concerns about starting it myself, but thought it would be fine because my husband could start it for me. It started right up for me, very easily. I chipped 3 piles of branches in one day and was looking for more. I havent successfully used the shredder though. The flap that guards against debris flying back up through the chute is incredibly stiff. I am concerned about using something to push things down into the chute beyond that flap. Overall I am very happy with my purchase. It's a win/win, I got rid of piles of branches and ended up with wood chips for around plants and for walking paths through the garden. I was skeptical at first about whether or not this chipper would meet my needs. I had several people tell me it was to small and would take extra time to chip large 2 1/2” limbs. After working with the chipper for a couple hours I was very pleased with the performance of my chipper. Have had this unit for 1 year now so figured it was time for a review. In a word, it's amazing. The thing powers through branches and makes clean-up manageable. I probably have about 20 hours on the machine with no issues - really just eats wood. I stored the machine with minimal attention fuel stabilizer all winter and it started and operated for three hours today on the first pull. The two small concerns I had were addressed by customer service in a no hassle manner. Great products, great company. This is the first chipper I've ever used; it works better than I expected. I'm 75 yr old, avid gardener. The manual start is easy. The noise level doesn’t, annoy neighbors ( lots are 1 to 2 acre). I ground up several years worth of limbs and clippings in an afternoon. Thrilled that I'm finally making my own mulch. I bought a reconditioned chipper model. It arrived in good shape, like new. Assembly was easy. Was reluctant before using as to whether it would do the work I wanted. Boy was I surprised. It chews branches great! On straight limbs, it practically self feeds itself. Privet hedge is my main material and it takes care of that stuff great. It bogs down a little the larger the limbs but not bad. Green material works better than dead material. I’m working on slowly clearing an acre of underbrush and this is the perfect tool for the price point I wanted. I’d recommend this product to anybody. I had purchased this unit from a local Lowe's location and was using it for the first time when a mechanical failure in the flywheel assembly caused several components to be damaged. I wrote customer service on Sunday and promptly on Monday they contacted me and worked diligently to resolve the problem. The most unexpected things can happen when dealing with mechanical machines... it's a fact.. sooner or later something can go wrong. When it occurs is where you find the real value of the brand you trusted in making your purchase decision I found DR to have customer service 2nd to none... prompt.. professional and without a doubt, leaving me with a lasting impression that will strongly influence my future purchasing decisions. Purchased electric start model. Received both boxes same day. Took 1.5 hrs to assemble. This model doesn't come with leg attached, so a bit unwieldy. Last task was to connect battery cable and that was brutal! Battery underneath and difficult to access. Just ran a good sized pile of brush and limbs and it works great! Very happy with it. Just fired my DR 9.5 chipper up for the first time yesterday. As a test, I ran some old pine limbs through the limb chute. The limbs ranged in diameter from 1" to 3+" The DR chewed them right up (slowing a little as expected on the larger limbs). The chips produced were just perfect for landscaping or filling in beds. The shredder works best on dry material. I ran some ice plant through it and got a misty film. Stick to leaves and brush. All in all, I'm really delighted with this purchase. This machine is so far superior to my old MTD shredder. Really no comparison. The DR is well made, works as advertised, and is value priced. Less patient people than myself might consider it a downright inconvenience, and I realize that the tolerances just worked against me, but I have to completely remove the chute to check/add oil. Seems like somebody should have checked that. Otherwise it devours stuff like a hungry teenager. I suppose some day I'll have to remount the engine and try to get that quarter inch back somehow, but I'll have some nasty thoughts about quality control just the same. Some troubles getting the order correct and some problems with shipping, but eventually everything arrived. I assembled it and it started on the first pull. Fill it with oil before you assemble the chipper chute. I bought a little flexible neck that fits right on an oil bottle from Advance Auto. Perfect for filling the engine with oil. The shredder completely pulverized the leaves and whatnot for my compost pile... dust galore... needed a respirator. Tried a few branches in the chipper and seemed to take care of them quickly. Jury is out on how long the blades and flails last. This chipper shredder does exactly what is advertised. The assembly instructions and operator manual are clear and easy to follow. It is easy to move around my yard, so I can get it close to wherever I am working. It really reduces limbs, branches and leaves to a very small pile. I highly recommend this product. I was looking for a chipper to clean branches from our 1 acre property and when the garden dies in the fall I can't wait to shred garden debris before it goes into my compost pile. I have just finished about 2 hours of work with it and so far has held up nicely. I didn't notice the engine struggling when I was chipping 2-2 1/2" inch branches. Most chipper shredders I have used have had trouble with the chipping side of things, not this one, very fast!! Can't wait to see what it does to my garden refuse. Just tested the new DR 9.5 Chipper Shredder. First of all, it's a great size. I have a big garden but a small garage. I love how easy this was store in my garage and then roll out to my garden on the weekend. Second plus: it ate all the garden garbage I gave it -- old bean plants, squash vines, weeds, no problem. I had a few branches from a nearby maple tree so I chipped those up as well. Works for me! The DR 9.5 FPT Chipper w/ Shredder is our most compact model, but don't let the size fool you. Its super high rpm makes all the difference. The knife (backed by the combined flywheel/hammermill mass) striking at 160 mph chips with ease. Eight tightly packed shredding hammers (a mixture of flat and J shaped) spinning at 3600 rpm simply pulverize material. The robustness of this unit's direct drive design makes the high rpm possible. The hardened knife and hammers, overall solid steel construction, large hoppers, clever hand holds, and pneumatic wheels with ball bearings makes this unit DR brand worthy while still being light and maneuverable for homeowners with smaller properties. A.Thank you for your question. The high-carbon/ high chromium forged alloy tool steel is exceptionally strong and has an excellent edge holding ability. This means the knife has the potential to be used for 20 hours without having to be sharpened. The knife can also be easily removed and taken to a service center for sharpening. Q.Does the chipper shredder include an additional chipper blade with the purchase? Q.What does the extended warranty cover. If the shredders come with a 2 year warranty. A.Thank you for your question! All of our reconditioned units come with the same standard two year warranty that our new ones come with. You are able to extend the warranty by up to three additional years. Giving you a total of five years of protection. This warranty will cover manufacturers defects on non wearable parts. We will cover the cost of parts, shipping of the parts, and the labor at a local service station. Please let us know if you have any other questions. 31 people found this answer helpful. Q.How is this unit shipped? delivered to home by UPS or pick up at freight carrier dock? A.Thank you for your question. The 9.f Chipper Shredder is delivered via UPS. It will ship in two boxes. Please feel free to contact us if you have any other questions. A.Thank you for your question. The 9.5 Chipper Shredder electric start does have a manual back up. Please feel free to contact us if you have any other questions. A.Thank you for your interest in the DR Chipper Shredder. The top Hopper is not for the larger branches, it is to feed smaller, softer material into. Such as grass, leaves, garden waste, etc. The side hopper is what you would use for the three-inch branches. Please feel free to contact us if you have any other questions. A.Thank you for your interest in the DR 9.5 Chipper Shredder. This electric start unit is run off of a battery. No extension cord necessary. Q.What is the width of the wheel base to the outside of the wheels. I want to take it up a narrow garden path. A.Thank you for contacting us. The widest point on the DR Chipper Shredder is going to measure 24"